Thanks to a new partnership with Chesapeake Public Schools, Tidewater Community College and the City of Chesapeake, 27 high school freshmen are preparing for an in-demand career in mechatronics while still in high school. Mayor Alan Krasnoff proclaimed October 30 as “Manufacturing and School Partnership Day” in honor of the TCC and Chesapeake Public Schools mechatronics pathway. 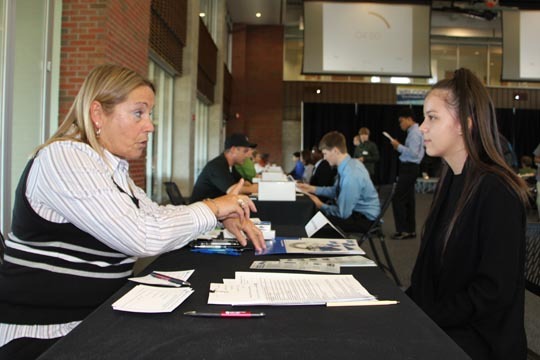 The new dual-enrollment program began with a mentor-matching event, giving students the opportunity to connect with advanced manufacturing representatives. The program also included a scholarship drive among area manufacturers, bringing in $12,000 to help students pay for college courses while still in high school. Participating organizations are Air Systems International, GeoQuip Manufacturing, Manufacturing and Design Tech, Mitsubishi Plastics Composites America, Nitto Denko, Sumitomo Drive Technologies, Usui International, Yupo Corporation and the City of Chesapeake Department of Economic Development. The scholarship drive began with the kick off of Advanced Manufacturing Month and a plant tour of Mitsubishi Plastic Composites America on Oct. 9. Steven Wright, director, City of Chesapeake Department of Economic Development, spoke about the city’s diverse economy and attributed its growth to the strong base of manufacturing firms in the region. “It’s only fitting that we recognize manufacturing in Chesapeake with a month-long celebration,” Wright said.